Improves the consistency and balance of alchemy and potions in general as well as correcting some cheat-like features present in vanilla; such as healing while in the menu or creating completely overpriced potions. Take a look at the feature list for a better idea. Pretty Animated Potions patch for Alchemy Potions and Food Adjustments Only touches the potions, but works with both the Full version and the No Food version. This mod is licensed under a Creative Commons Attribution-NonCommercial 4.0 International License (CC BY-NC 4.0). You can consider this mod as a resource. Feel free to copy, modify and upload this mod anywhere, as long as it is for non-lucrative purpose. Bethesda Softworks for making TES:Skyrim and the Creation Kit. All members of the xEdit team. All members of the SKSE team. All members of the SkyUI team. Denis Matei for the illustration. 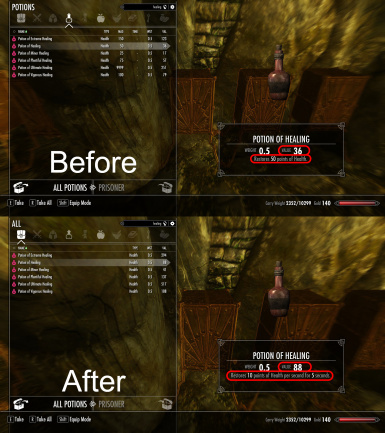 New Version: Potion Restore Over Time Only Version. Removed Version: Food Only Version. New: Damage Speed (Slow) effect now affects weapon swing speed. New: Damage Speed (Slow) effect contains a bug fix to make it apply more rapidly. New: Cure Disease/ and Cure Poison now scale. Change: Slight adjustments off effects on some food items. Change: Experience bonus is now only applied when in the crafting menu. Change: Some MCM slider are more precise. New Requirements: SKSE 2.0.7+ and SkyUI. New Version: No food change. New: Ravage H/M/S, Slow poison, Weakness to poison poisons, resist poison potions and waterwalking potions created and added to leveled lists. New: Missing Cure poison and Waterwalking effect added to ingredients. Change: Complete rebalance pass. Crafted potions should now be even more consistent with leveled potions. Change: Fortify and resist potions last 120 seconds. Change: Fortify enchanting/smithing/barter last 300 seconds. Change: Added proper tags for bashed patch. Vanilla Bug Fix: Some potions where assigned to the wrong mesh. Vanilla Bug Fix: Inconsistencies and errors in potions/poisons leveled lists. New patch: Weapons Armor Clothing and Clutter Fixes Patch. Removed patch: Awesome Potions patch no longer supported. 17.04.21: Uploaded a patch adding this mod's food effects to the food items from Dawn of Skyrim. Added the "ingredient" keyword to some ingredients, this has no effect on the gameplay but allows compatibility for my economy mod (Economy Overhaul and Speechcraft Improvements). Forwarded changes made by recent versions of USSEP. Human hearts and flesh can now be sold to apothecaries. Corrected the value of Clam Meat, Firebrand Wine and Gourd. Slight readjustment to the restore Health/Stamina/Magicka potions potency and cost. Slight readjustment to the damage Health/Stamina/Magicka poisons cost. The goal of this mod is to improve the consistency and balance of alchemy and potions in general as well as correcting some cheat-like features present in vanilla; such as healing while in the menu or creating completely overpriced potions. This mod tries to make alchemy balanced, coherent and consistent while staying as close to the vanilla spirit as possible. 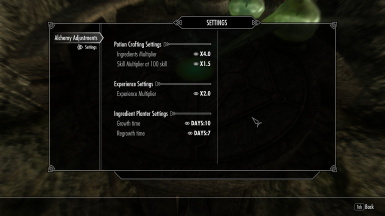 Game settings regarding Alchemy are customizable with an MCM. Ingredient potency multiplier, skill multiplier and experience multiplier are customizable. Because XP gained is linked to the gold value of the potion created and because you can no longer craft overpriced potions, I recommend putting the XP multiplier at a value above 1 (2 by default). This XP bonus is only applied when the crafting menu is opened. Ingredient planter growth is also customizable, this mod default values making ingredients grow/regrowth much slower (10-7 days instead of 1-3). 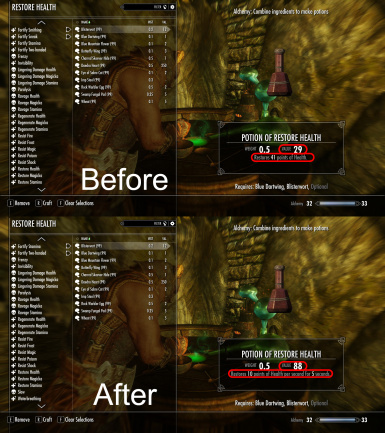 Restore Health/Stamina/Magicka potions have their effects spread over 5 seconds. You will not be able to insta-heal while in the menu. These effects do not stack. If you drink multiple restorative potions with the same effect while in the menu, only the most powerful one will work. This include crafted and non-crafted potions. Ultimate restorative potions now heal 50 points of Health/Stamina/Magicka per second for 5 seconds (250 points total). Poisons types, potency and values are readjusted. 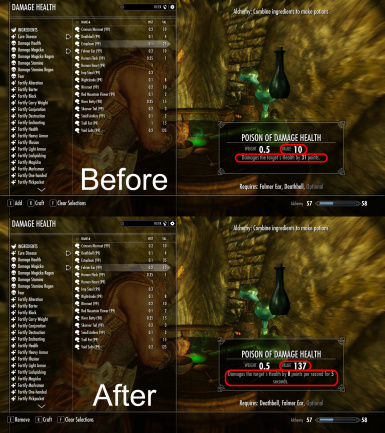 Poisons of damage Health/Stamina/Magicka now have their effect spread over 5 seconds (instead of being instantaneous). Lingering poisons now do 2 (Health) or 3 (Magicka/Stamina) points of damage per second; their potency depends on how long they last. Missing potions and poisons from random loot are re-added. Some craftable potions/poisons were missing from the vanilla leveled lists, rendering them almost non-existent in the game unless crafted (they couldn't be found in random loot). See here for more details. This was most likely due to an oversight or a lack of time from Bethesda so I added them. - "Resist Poison" potions (potion, draught, philter and elixir levels). - Waterwalking" potions (potion, draught, solution, philter and elixir levels). - Ravage Health/Magicka/Stamina poisons (weak, normal, potent, virulent and deadly levels). - Speed poisons (weak, normal, potent, virulent and deadly levels). - "Aversion to Poison" poisons (weak, normal, potent, virulent and deadly levels). - Health/Magicka/Stamina Lingering poisons (weak, normal, potent, malign and deadly levels). - Damage Stamina/Magicka Regeneration poisons (weak, normal, potent, malign and deadly levels). Missing effects from Alchemy are re-added. 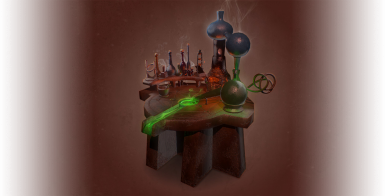 Some alchemy effect existing in the game and represented by potions in leveled lists were missing from ingredients and thus alchemy. The "Cure Poison" and the "Waterwalking" effects have been added to ingredients, and potions with these effects can now be crafted. I was careful to replace effects that were represented lots of other ingredients and that were not mentioned by recipes in the game. The values of crafted potions now depends mostly on their potency and not their effect type. You will no longer be able to craft overpriced potions (such as paralysis or damage Stamina/Magicka regeneration). While some effects are still more valuable than others, the potency of the potions created (ie: your alchemy skills) is now the predominant factor to determine their price. Non-crafted potions value and potency are more consistent with alchemy. In vanilla some potions found in loot were a lot stronger than what the player could craft, even with high alchemy skills. Other potions were a lot weaker, rendering them completely useless. 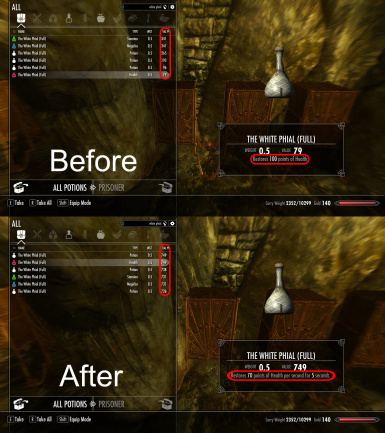 With this mod, potions found in loot are more on par with potions made by the player. Ingredients effects are now more consistent. In vanilla, some ingredients produced non-standard potion strength. See here for more details. While this is an interesting feature, I think it was badly implemented. Some very common ingredients had a big multiplier, while rare ingredients had none. Some ingredients had their strength diminished for no reason. With this mod, rare ingredients are stronger while other ingredients all have the same strength. I selected ingredients available in limited quantity, rare to find or only available in a specific location. The following ingredients will create potions 1.5x stronger: Fire Salt, Frost Salt, Void Salt, Wisp Wrappings, Spriggan Sap, Taproot, Hagraven Claw, Hagraven Feathers, Briar Heart, Daedra Heart, Moon Sugar, Ancestor Moth Wing, Gleamblossom, Yellow Mountain Flower, Poison Bloom, Emperor Parasol Moss and Burnt Spriggan Wood. Fortify enchanting/smithing potions crafted with rare ingredients are only about 1.1 times stronger to prevent creating overpowered potions. An optional file that adds an asterisk to rare ingredients names to better distinguish them is available. Fortify and Resist potions last longer. The vanilla duration (60 seconds) was too short. 60 seconds tends to fly by when you are fighting making those potions not as useful and used as they should. Crafted and non-crafted potions of "Fortify X" and "Resist X" now last 120 seconds. Enchanting, Smithing and Barter potions now last a lot longer. The vanilla duration (30-60 seconds) was too short. You always had to rush enchanting/improving/selling your items hoping the effect did not end before you were done. Crafted and non-crafted potions of fortify Enchanting/Smithing/Barter now last 300 seconds. Previously non-scalable potions now scale properly. In vanilla, both Cure Disease and Cure Poison do not scale. They have the same effect no matter the player alchemy skill end perks. With this mod, Cure Disease/Poison have a percent chance of working instead of being guaranteed. Their chance to work depend on the potion potency. Different Cure Disease/Poison potions are added to the leveled lists and will be found naturally in loot. The White Phial is more powerful. The vanilla effects were pretty weak for what is supposed to be a valuable ancient artifact. With this mod, all its effects are way more potent, without being overpowered. - Restore Health: 100 points --> 80 points per seconds for 5 seconds (400 points total). - Resist Magic: 20% for 60 seconds --> 75% for 120 seconds. - Fortify Magicka: 20 points for 300 seconds --> 250 points for 120 seconds. - Fortify Stamina: 20 points for 300 seconds --> 250 points for 120 seconds. - Fortify One Handed: 50% for 60 seconds --> 85% for 180 seconds. - Fortify Sneak: 20% for 60 seconds --> 75% and invisibility for 90 seconds. Keep in mind that you can only use one of these effects, once a day. Food now gives lasting improvements on regeneration rate. The restoration effects in vanilla didn't make much sense. I changed the useless restoration effects to weak but long regeneration rate bonuses. - Meat, milk, cheese and butter (proteins and fats) based food now give a Health regeneration bonus. - Vegetables (fibers) based food now give a Magicka regeneration bonus. - Sugar (carbohydrates) based food now give a Stamina regeneration bonus. - Cooked Food effects depend on their ingredients. Cooked food effects are a bit stronger, so there is an incentive to cook your food. 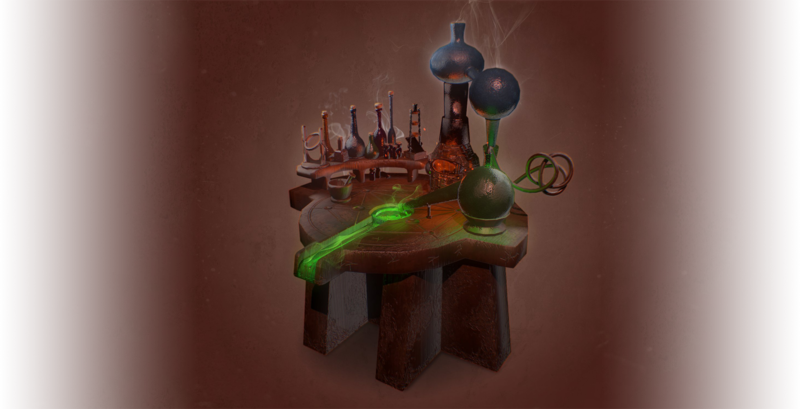 Effects from food, alcohol and potions are independent, so they do not cancel each other. Skooma in vanilla was quite boring (a simple restore stamina effect and no negative effect). 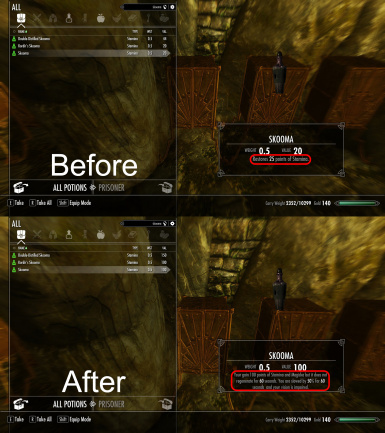 With this mod, skooma fortifies Stamina and Magicka by 100 points for 60 seconds but you do not regenerate either. You are also slowed by 50% and your vision is impaired. Some vanilla bugs not corrected by the unofficial patch are fixed. Some potions were linked to the wrong mesh. 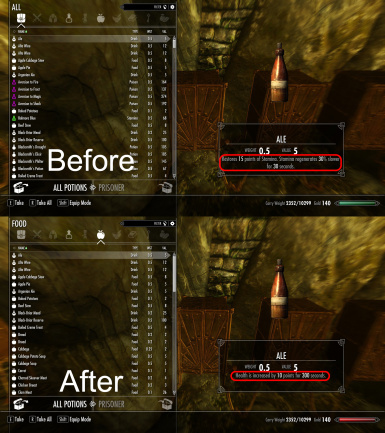 Some leveled list had inconsistencies, errors or missing potions. The Slow effect bug described here is fixed (for poisons). This melee swing speed is now also slowed by this effect. The Unofficial Skyrim Special Edition Patch changes are forwarded. You need Skyrim Special Edition V1.5.39 or above. 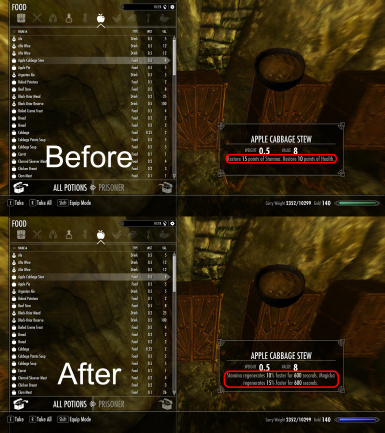 You need the Skyrim Script Extender SE build V2.0.7 or above installed (SKSE64). You need SkyUI Version 5.2SE+ for the configuration menu to work. You need to install the Unofficial Skyrim Special Edition Patch. You will crash on startup if you don't. Installation with a FOMOD installer. A mod manager that support those is required (Mod Organizer 2 or Vortex for example). If you install this mod mid-playthrough or update from V1.x to V2.x: the effects of potions crafted before installing this mod won't be updated. Potions found in loot will be. I would recommend using or ditching player-crafted potions before installing the mod, otherwise some will have weird effects description and/or weird gold values. This mod is not compatible with any mod that changes ingredients, potions, alchemy or food effects. It is compatible with mods that change the alchemy perk tree, but I can not guarantee that changing perks won't cause balance issues. It is compatible with potions texture and meshes replacement (as long as they don't have an .esp). If you have a doubt, check with SSEEdit for conflicts. If you see any conflict and can't do a compatibility patch yourself, post a request in the comments. I'll look into it, but no promises. While this mod is not technically incompatible with Ordinator, I do not recommend playing with both. My mod was not designed with Ordinator's perks in mind so you may have balance issues and conflicting features. This mod is compatible with Ineed. If you want "Ineed Extended" to remove the food effects, load it after my mod. If you play with Economy Overhaul and Speechcraft Improvements, "Alchemy adjustments" should be placed after it in your load order. A patch adding this mod's food effects to the food items added by Dawn of Skyrim (Director's Cut) is included in the installer. A compatibility patch for Weapons Armor Clothing and Clutter Fixes is included in the installer. A compatibility patch for Awesome Potions is included in the installer. This patch conflicts with the wACCF patch and the lightweight potions addon. A version of the mod without the food effects changes is included in the installer. It is compatible with mod that change food effects. 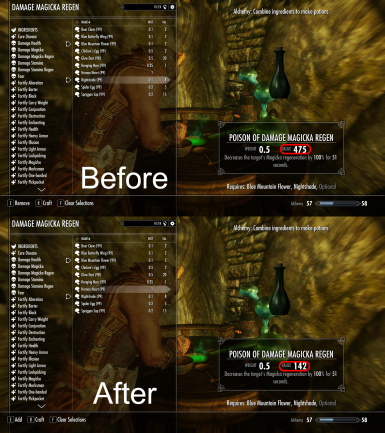 A version of the mod with only the Health/Magicka/Stamina restore over time feature is included in the installer. A optional addon that adds an asterisk to rare ingredients names to better distinct them is included in the installer. A optional addon that changes potions weight from 0.5 to 0.2 is included in the installer. All patches and addons are .esp flagged as .esl. A patch for Creation Club Survival Mode is kindly provided by miguick here. A patch for Pretty Animated Potions is kindly provided by fenrir0054 here. - Stacking with this mod works exactly the same than in vanilla. - The most powerful effect takes priority. However, the weakest effect is not canceled. It is simply not active as long as there is a more powerful effect of the same type. - For example: if I drink a potion of restore Health (that lasts 5 seconds), wait 3 seconds, then drink a weaker potion of restore Health, only the first potion will be active for its 2 remaining seconds, then the weaker potion will be active for its 3 remaining seconds. - Effects of the same type can only accumulate if they are not from the same source. With this mod, the different sources are alchemy, food, alcohol and skooma. Stamina restoring over time has the unwanted effect of allowing the player to spam bash and power attacks. (Only 1 point of stamina is required to initiate those attacks, even if they normally costs 30 Stamina points.) I recommend you check out this mod to fix this. Kaburke and any other who worked on the FOMOD Installer system as well as Wenderer for its FOMOD Creation Tool.